A stunning route that follows the Modikhola (River) Valley up to the Annapurna South base camp. 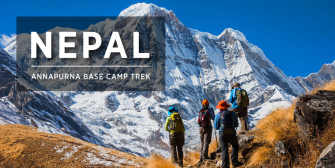 The base camp is located in a beautiful natural bowl formed by a ring of eight 7000+ Himalayan peaks. As the trek progresses, it passes through a huge variety of landscapes as the altitude increases until the glaciers of the Himalaya are reached at the sanctuary. The Annapurna Region in central Nepal is the most geographically and culturally diverse region for trekking. This entry was posted in Upcoming Treks. Bookmark the permalink.